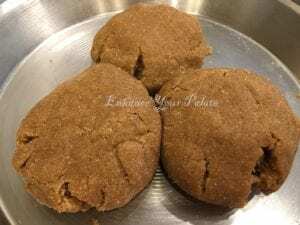 This recipe is a part of authentic Rajasthani ‘Dal–Bati-Churma‘ combination. 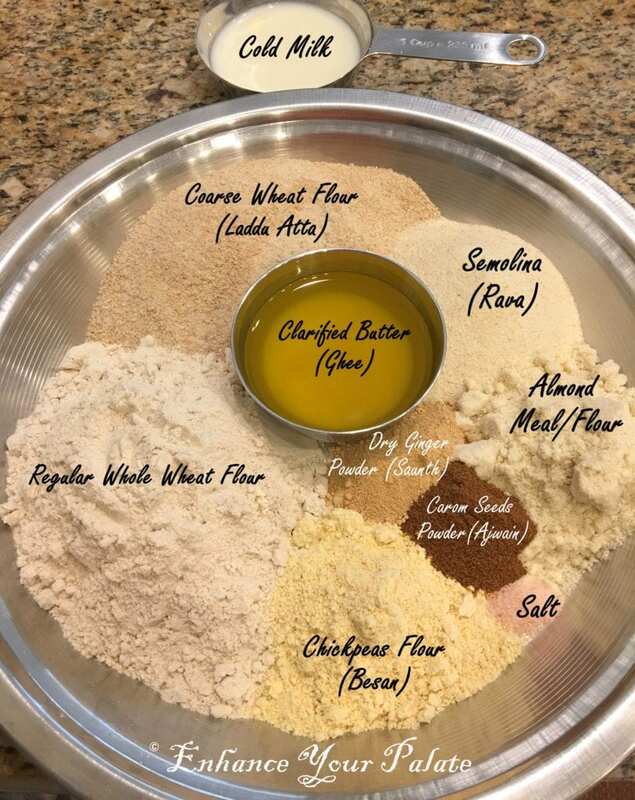 ‘Churma’ means crumbled, which in Indian cooking is used for recipes where a cooked bread is crumbled and mixed again with other ingredient and served in various forms. 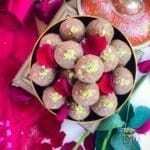 ‘Ladoo’ refers to ball shaped sweets commonly served in India on festive occasions. 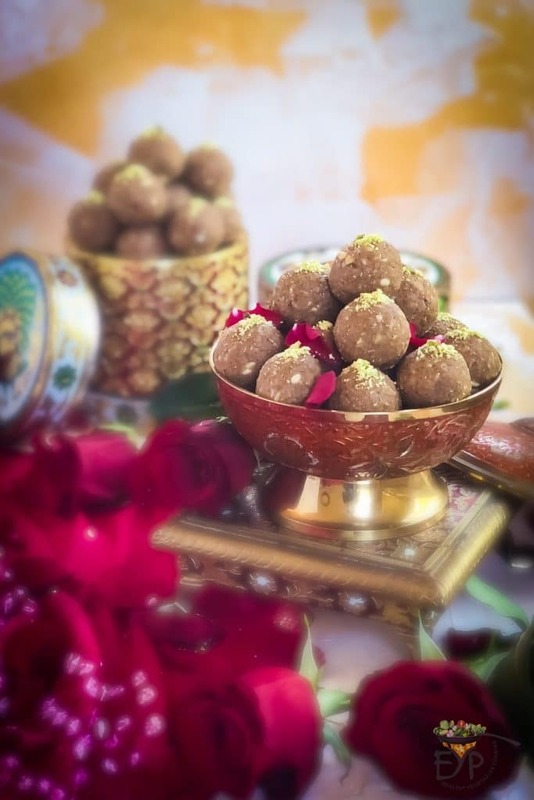 Hence, ‘Churma Ladoo’ is a recipe for ball shaped sweet made out of crumbled Bati. Bati is an unleavened bread that is hard from outside but soft from inside. It originated from the desert areas of Rajasthan. This authentic recipe has been further enhanced by mixing different flours, spices and nuts. Added ingredient such as carom seeds powder (Ajwain) helps in digestion, coughs and asthma, arthritic pains, acidity and cardiac health. 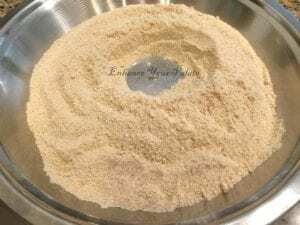 Another ingredient, dry ginger powder (Saunth), also help in digestion, acts as anti-inflammatory, lowers blood sugar, fights flue and common cold. Nuts provide unsaturated fats, omega 3 fatty acids, fiber, vitamin E and proteins. 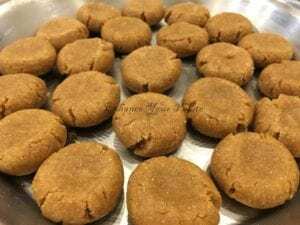 Overall, these ‘Churma Ladoo’ are a healthy bite size hearty snack packed with healthy fats, proteins, vitamins and mineral. You can make these once and store in dry conditions for a long time. Snack anytime, if you are feeling low on energy or to satisfy your sweet tooth cravings just serve as a dessert. Please note that ‘No one can eat just one‘. 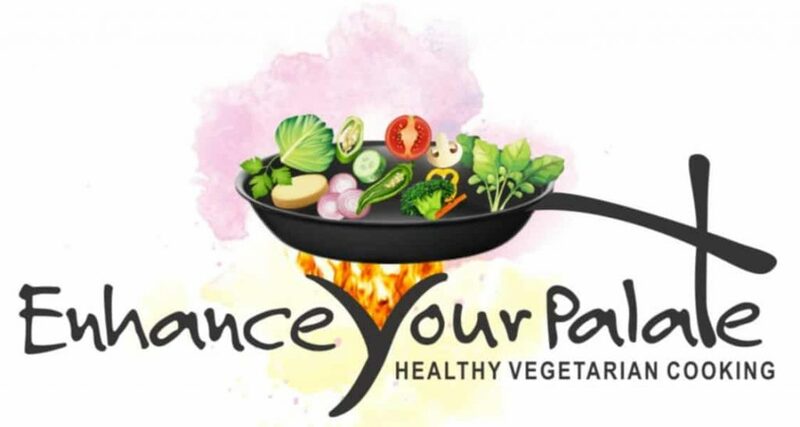 Once you try it, you would want to eat more. You may also order these from us to save your time and effort. Sugar or Jaggery – 1.5 cup powdered, adjust the quantity according to your taste, we prefer sweetness on lighter side. 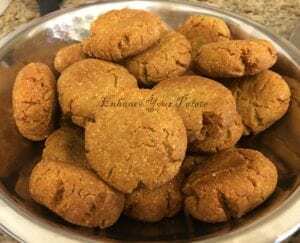 Transfer all the dry ingredients (coarse wheat flour, semolina (rava), regular whole wheat flour, almond meal/flour, chickpeas flour) along with carom seeds powder, dry ginger powder and salt into a mixing bowl and mix. Add clarified butter (ghee) to the mixture and mix again. 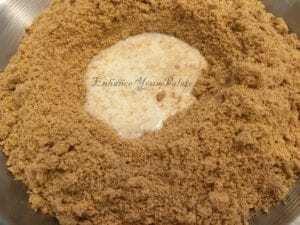 After through mixing, your mixture should be crumbly as shown in the picture below. Now add milk and knead it into a stiff dough. Kneaded dough should look like in the picture below. 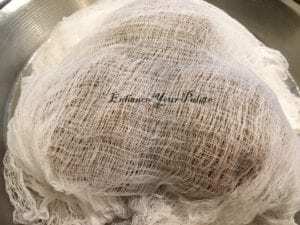 Cover the dough with a cheese cloth and let it rest for 30 minutes. Divide the dough into small equal size balls. Flatten them a little bit and make a thumb impression in center to make baatis. Heat ghee in a deep pot (kadhai) for frying. Deep fry few of the baatis at a time at medium heat until they turn golden brown. 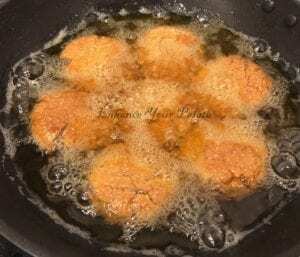 Turn them during the frying process to make sure they are evenly cooked on all sides. Medium heat is important to make sure that thick baati is cooked all the way inside. Let the fried fried baatis cool down till they are easy to work with. 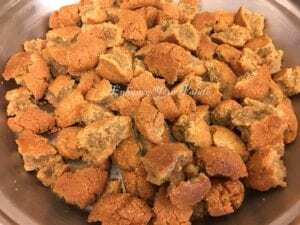 Now break the baati by hand first into smaller bread crumbs. Then use a food processor or a mixer to turn these crumbs into a coarse texture mix. If you feel that you don’t have a uniform mixture, then sieve the mixture and blend the bigger crumbs again. Transfer to a mixing bowl and add powdered sugar, chopped nuts and cardamom. Mix it thoroughly. Now add a little bit of clarified butter (ghee) as binder one spoon at a time till the mix starts binding easily in small balls. Now bind them into small balls. You may may smaller size balls for portion control and make regular/large size balls. 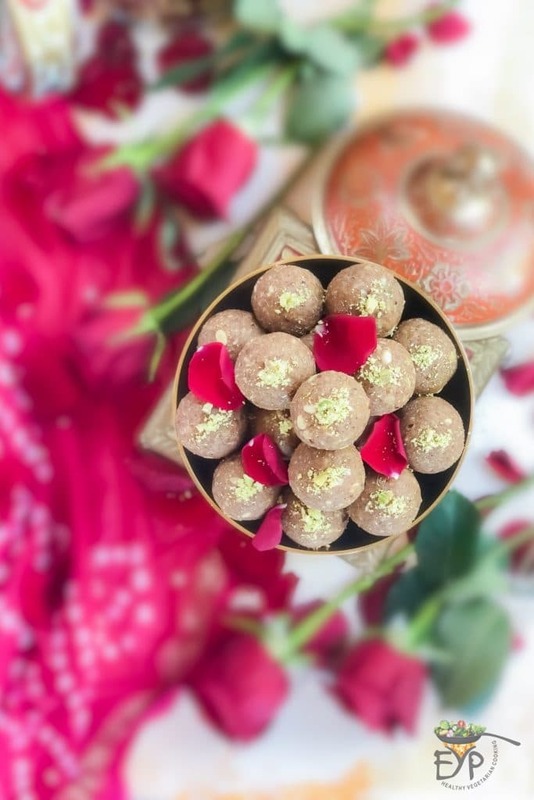 Your Churma Ladoo is ready. Store in cool dry places in an air-tight container. Let us know if you like it or have any questions about the above recipe. This recipe is a part of authentic Rajashani 'Dal-Bati-Churma' combination. 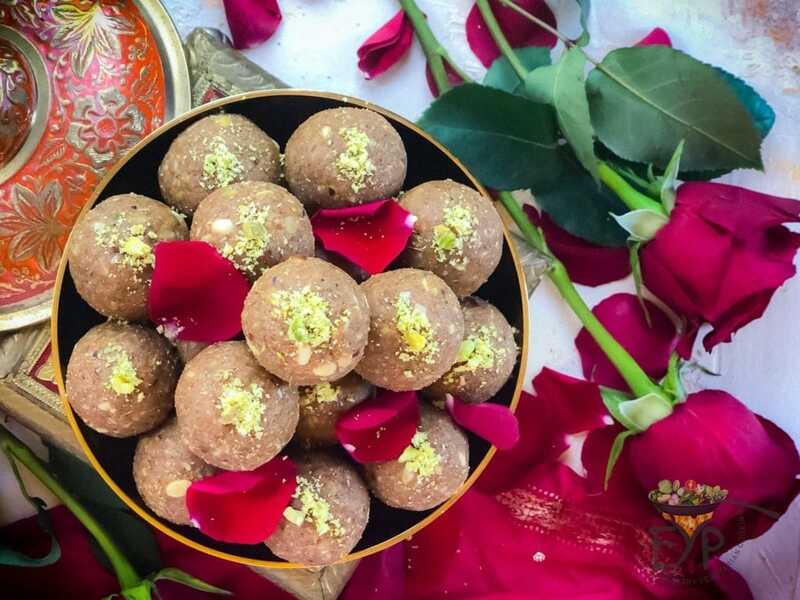 ‘Churma Ladoo’ is a recipe for ball shaped sweet made out of crumbled Baati, which is an unleavened bread, hard from outside but soft from inside, cooked in the desert areas of Rajasthan. This authentic recipe has been further enhanced by mixing different flours, spices and nuts. These are highly nutritious both from the energy perspective and other nutrients. 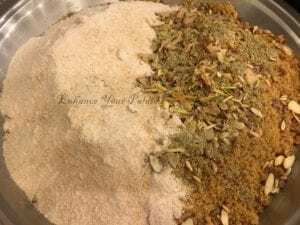 Added ingredient such as carom seeds powder (Ajwain) helps in digestion, coughs and asthma, arthritic pains, acidity and cardiac health. 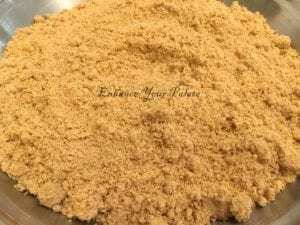 Another ingredient, dry ginger powder (Saunth), also help in digestion, acts as anti-inflammatory, lowers blood sugar, fights flue and common cold. Nuts provide unsaturated fats, omega 3 fatty acids, fiber, vitamin E and proteins. Then use a food processor or a mixer to turn these crumbs into a coarse texture mix. 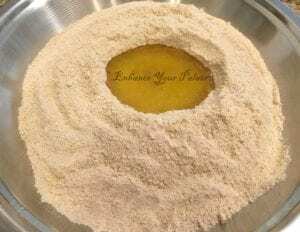 If you feel that you don't have a uniform mixture, then sieve the mixture and blend the bigger crumbs again. 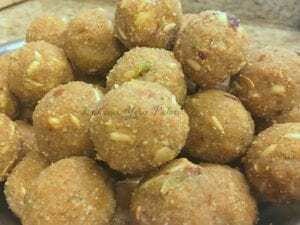 Your Churma Laddu is ready. Store in cool dry places in an air-tight container. Awesome ladoos. Everybody in my family loved them! Perfect snack for the kids too. Loved them!!! Meesha, I am so glad that liked them. Let me know when you need your next round of ladoo, would be happy to send you? 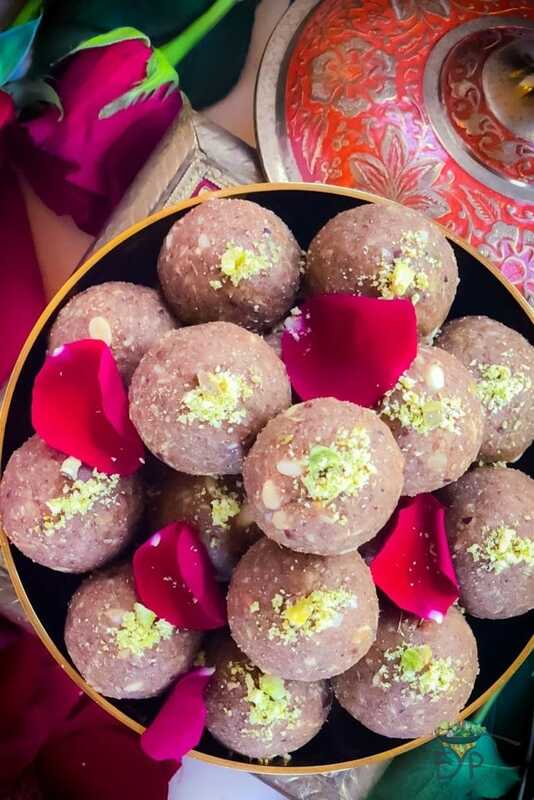 These laddoos are melt in the mouth and melt the soul kind laddoos! I had the good fortune of trying these. 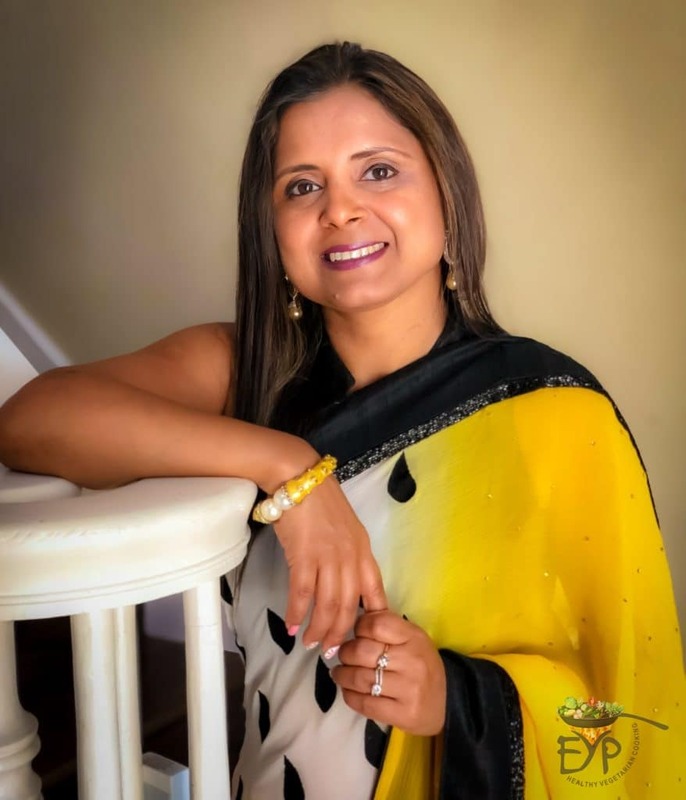 Thank you, Rupali! Thank you Neha for your review. 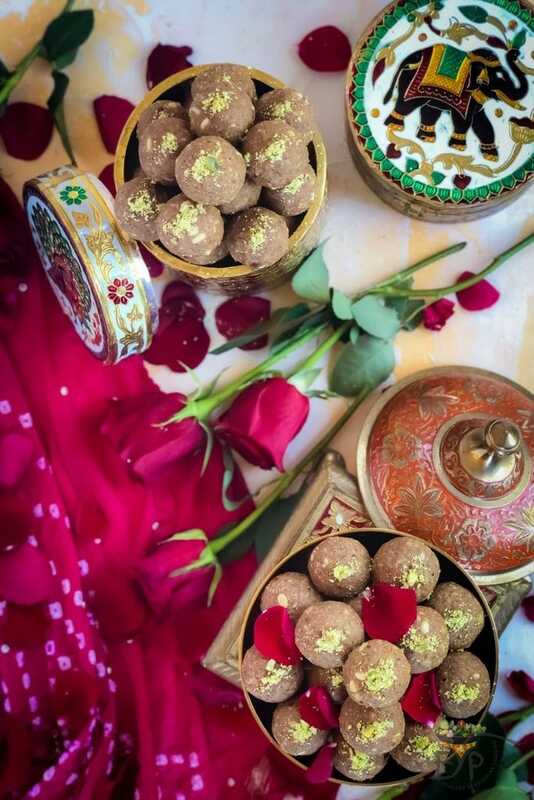 I am so happy that you loved the Ladoos?